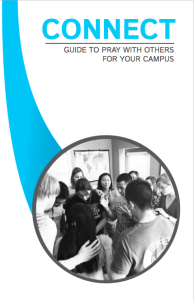 Campus Renewal has partnered with influential college ministry leaders to create daily and weekly prayer guides for those who would like to be praying for college campuses. We provide them for free to anyone who joins the College Prayer Accord. This is a commitment to praying once a day individually, praying once a week with others, and fasting once a month–all for God to move on college campuses. Find out more info and sign up to receive a free copy of our prayer guides and more! Sign up for a FREE prayer guide!